This entry was posted in Book Memes, WWW Wednesdays and tagged book memes, colleen hoover, eve, glass sword, ice like fire, iris johansen, is everyone hanging out without me?, jessie burton, kindred spirits, mindy kaling, one, queen song, rainbow rowell, random, rebecca whitney, sara raasch, sarah crossan, steel scars, the liar's chair, the miniaturist, tom leveen, ugly love, victoria aveyard, www wednesdays by Yvo. Bookmark the permalink. It looks like you’ve read some fab books this week! I have Kindred Spirits and One on my TBR and think I’m going to bump them up to the top now I’ve read your comments on them. I have The Liar’s Chair on my TBR too but haven’t got to reading it yet, I’ve heard lots of good things about it so I hope you enjoy it. I hope you have a great bookish week! Kindred Spirits and One are definitely perfect short reads; I hope you’ll enjoy them! The Liar’s Chair isn’t that good though so far (unfortunately). Oh that’s a shame about The Liar’s Chair. I hope the next book you pick up will be much better. Wow so many books finished…I can’t read 6 books in a month so well done! I definitely have one of Kaling’s books on my TBR. I’m glad to hear you enjoyed Is Everyone Hanging Out Without Me? I’ll be interested to hear what you make of Glass Sword. I only thought Red Queen was ok (it was a bit predictable and a mash-up of things I’ve seen done better in other books) and I’m hoping the sequel will be better. I enjoyed Is Everyone Hanging Out Without Me?, but her other book Why Not Me? is definitely better. And I read Red Queen last year, but don’t remember all the details… I didn’t like the novellas, but I’m going to reread Red Queen soon and Glass Sword afterwards; hopefully I will still like the story after reading so many great fantasy/dystopian series last year. Wow, you had a great reading week!! That’s awesome. Yay for Ugly Love!!! It’s my favorite CoHo (or was until November 9 happened). I hope you enjoy it! I’m looking forward to pick up another of her novels! November 9 was on my 2015 favorites list, so I can wait to continue reading it today. You’ve read a lot of awesome books this week! Can’t wait to see your reviews on them! Most of these are either novellas or short reads, so that did help. 😉 Good to hear you love Ugly Love and Maybe Someday! I’m looking forward to continue the first today and I will probably read the other one some time next month. I’ll be interested to see what you think of Ugly Love. People seem to either love it or hate it. I loved it. I have been reading it today, and while I really liked it in the beginning the characters are starting to annoy me… Fingers crossed things improve. The Miniaturist is on my TBR – like you I am not in a very historical mood at the moment so I don’t know when I will read it! It’s really interesting so far, but you definitely have to be in the mood for historical fiction to enjoy it. I read Ugly Love not that long ago and didn’t hate it but didn’t particularly like it either so will be interested to see what you think. Kindred Spirits is definitely an entertaining read and I liked the Star Wars element even though I’m not exactly a fan. I mostly found the Miles chapters frustrating although quite liked young him. I just wanted to know what happened and felt it was dragged out. Tate bugged the hell out of me. How on earth was she an ER nurse? She couldn’t even cope with a passed out drunk bloke. Yes exactly! That part of the story definitely wasn’t credible. I agree that the Miles chapters definitely dragged… But like you I prefer the young Miles over the current one. I love the cover for ‘Random’ it looks so interesting! I agree with what you said about Aveyard’s novella. I don’t feel that they added anything to my experience of reading the Red Queen series, but they weren’t totally awful. I have Kindred Spirits on my Kindle, just waiting for some quiet time to read it. Glad you enjoyed it though! Kindred Spirits is a superfast read and really entertaining! I hope you’ll enjoy it. Good choice to reread Red Queen before starting on Glass Sword! I hope you like ‘The Miniaturist.’ I liked the story, but I was expecting the miniaturist to play a bigger role in the book. Looking forward to your thoughts. Happy reading and thanks for participating in WWW Wednesday! I agree that the miniaturist doesn’t play a big role so far in the story… I’m about halfway into the book and I really like the Amsterdam/Dutch descriptions so far; it’s like a trip down memory lane and it is making me crave Dutch food as well. 😀 Happy reading and thanks for hosting! I’ve been meaning to read Colleen Hoover. Currently, I’m in a big fantasy mood, but when I get the craving for some contemporary fantasy, I’ll definitely pick up one of hers! Think I’ll probably try November 9 first. Ooh, Kindred Spirits sounds interesting! I like Rainbow Rowell’s books so I’ll have to check that out. I totally understand about not being in the right mood for a book. 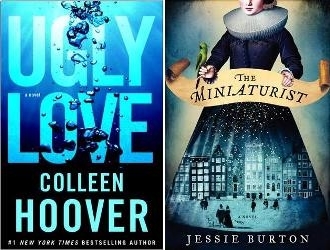 If you have to put The Miniaturist to the side, don’t feel bad about it. I had to do that recently with Six of Crows. Happy reading! Ugly Love – oh my.. I hope you adore this as much as I did. It’s the first one I picked up after Nov 9. Not as good, but pretty darn enjoyable. I was so sad not to enjoy Ugly Love… 😦 Especially since so many seem to love this book. It actually happens to me quite often that I have an ‘unpopular’ opinion, but I guess some books just aren’t for everyone. 😉 The fact that I don’t like romance in general explains a lot though haha. I’m hoping I will end up enjoying Maybe Someday though. I have seen a number of reviewers mentioning November 9, sounds like an interesting read. I am also interested in the Mindy Kaling book, seen it on Sam’s list too. Haven’t read anything by the author though. November 9 was one of my favorite 2015 reads even though I normally don’t really like romance… Definitely worth the read. I like the way Mindy Kaling writes and her books are entertaining even though I haven’t watched her shows. Why Not Me? is better than Is Everyone Hanging Out Without Me? though. Thank you. Definitely adding November 9 to my TBR list now 🙂 I will try find one of Mindy’s books since I have not read anything by her.Hopefully I will find, Why Not me first. I hope you enjoy Ugly love, I really want to get my hands on it! It seems to be an either love or hate story… I haven’t read Maybe Someday yet, but I loved November 9 so I’m definitely giving it a chance. Hopefully you’ll enjoy Ugly Love! Some great books here! I really enjoyed The Miniaturist, hope you do too. And I’m also not a romance fan but heard so many good things about Colleen Hoover! I dithered so much over the Miniaturist and still don’t have a copy – I hope you get into it soon. I’ve managed to finish it before the weekend and it was a really interesting read. Not perfect, but definitely worth reading!